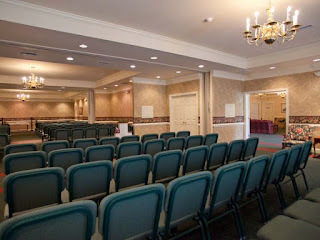 There was not enough seating for the hundreds who came to pay their last respects to Don Richards at the Omps Funeral Home in Front Royal, VA this morning. 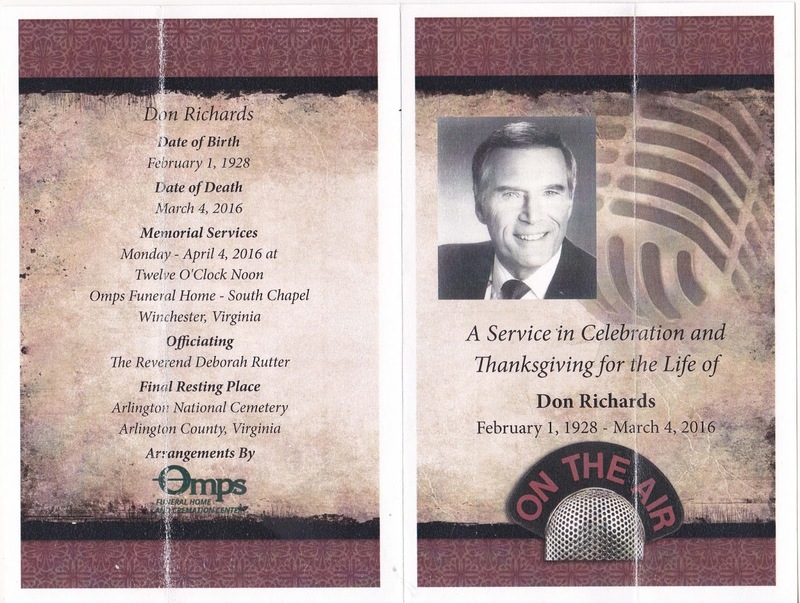 Don's children and friends crowded the Chapel in that mountain village saying goodbye to our dear friend Don Richards, who was probably the best ever...of the early TV announcers. He brought that enormous talent to the local community of Front Royal during his retirement years, promoting local events and charities with "Old Radio" recreations and dinner theatre performacies. The "standng room only" crowd mostly consisted of local residents, most of whom were unaware of Don's contribution to Washington, and yes, international Televison. For almost 10 years, he was the number one local newscaster in the Nation's Capitol....where he was President Eisenhour's favorite newscaster. In the early 60's Don became "the World's" most recognized TV personality....due to a series he did with the USIA called "Let's Learn English" which was broadcast in prime time in over 51 coiuntries. My impression was that the locals only knew Don as a neighbor.....a very special one. A Word from the "Boss"
He could handle a booth announcer’s job with the best. And, multiple skills? He probably sold more cars than any announcer or newspaper add in Washington. He wrote, produced and delivered attention-getting (using intense music) commercials for a Chevrolet dealership in the Washington area. Yes, he could be a powerful, dynamic salesman! Personally, he was well liked and respected by all. His sense of humor and ability as a raconteur was well known, as was his fondness for old radio shows which he loved to reenact. Don was a friend. We’ll miss his welcoming manner… and charm We’ll miss his welcoming manner and charm. we’ll miss don. .